Lucille’s educational journey culminated in a bachelor’s degree in Organizational Leadership in May 2011. 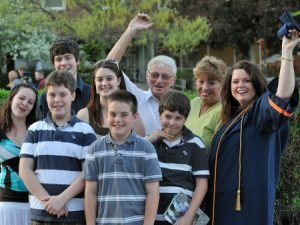 Surrounded by the loved ones who helped make it possible, Lucille accepted her degree as an Alumni Scholar, with one of the highest GPAs in the class. “My degree should have all of our names on it, because I believe we all graduated on that beautiful May day,” Lucille says.